Score a FREE night of bowling for the whole family! Via Shutterstock. There are 27 freebies today. Let us know in the comments if you learn of any more freebies, deals, or discounts. Don’t forget to follow us on Twitter @BargainBabe to snag more freebies. Follow us today! 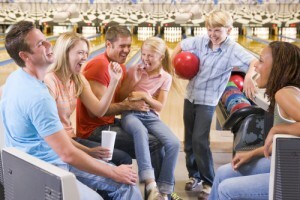 Free Bowling – AMF Bowling Co is offering up one FREE hour of Bowling (shoes included!) at all of their locations nationwide on Saturday, June 21st! The event will take place only from 7-8PM EST (6-7PM CST, 5-6PM MST, or 4-5PM PST) . Lane space is limited, so be sure to arrive early! Free Ocean Waves Soundtrack – Amazon is offering a FREE mp3 download of The Best Healing Music for Relaxation, Meditation & Sleep with Nature Sounds: Ocean Waves, Vol. 3 . Free Martha Stewart Living Magazine – Take a survey to score a FREE Subscription to Martha Stewart Living magazine, courtesy of Rewards Gold. Allow 8-10 weeks for delivery. Summer Learning Resources – Check out this huge list of FREE homeschool curriculum and resources from Money Saving Mom! Free Lifestyles Condom Sample – Just ‘Like’ the Lifestyles Facebook page to request a FREE sample of Lifestyle SKYN condoms. Free $3 Dunn Bros. Credit – Snag a FREE $3 credit when you download Dunn Bros. Coffee Rewards app and link your credit or debit card to your account. To use your credit, just visit a Dunn Bros. location and scan your phone. Available for a limited time onlu. Free Lipton K-Cup Samples – Watch a short video and you’ll be able to sign up for a FREE sample of Lipton Tea K-Cups. You’ll also snag a rare 75 cent off coupon. Sweet deal! Free Storytime Event at Barnes & Noble – On June 24 at 11 a.m. Barnes & Noble will host a Five Little Monkeys Storytime Event! Check your local store for participation. Free Photo Prints – Head over to Shutterfly where you can score two FREE 8×10 Prints! Just use promo code 8BY10 during checkout. This offer is valid for new Shutterfly customers only, thru June 25. If you’re already a Shutterfly customer there’s no need to feel left out – you can score the same deal this weekend June 21 & 22- when you usse promo code 2XFUN during checkout. Free Ben & Jerry’s eCookbook – Enjoy a FREE Ben & Jerry’s eCookbook from Workman’s Blue Plate Special only through June 30. 20% Off Cucumbers – SavingStar.com has just released a new offer good for 20% back (up to $2) on your loose cucumbers purchase valid through June 23. Free Wedding Guestbook – Visit the Shutterfly Facebook Page to score a FREE wedding guestbook! Free Family Summer Camp – In stores through July 13, Bass Pro Shops are having a FREE Family Summer Camp. This events includes a 4×6, crafts, family activities, workshops and more. Free Commandments Magnet – Get a FREE 10 Commandments magnet for your child! Note: Child must me between 4 and 14. Free Thumb Socks – DoSomething.org is offering FREE thumb socks to help stop texting while driving. Offer valid through August 14 or while supplies last. Free Samples with Sephora Purchase – Through June 30th, whenever you make a $25+ purchase at Sephora, you can score 3 FREE Deluxe Men’s Samples promo code GIFTHIM at checkout. Sweet deal! Free $5 Credit with Install of Amazon 1Button App – Through June 30th, head on over here , sign into your Amazon account, and install the Amazon 1Button App and you’ll snag a $5 credit towards your first purchase of $25 or more using the App. Note: This credit can only be used to purchase products sold and shipped by Amazon.com or digital content sold and delivered by Amazon Digital Services. Free $5 AMC Bonus Bucks Credit – Sign up for AMC Stubs text message alerts and as a thank you, you will receive a FREE $5 AMC Bonus Bucks credit to your account. Offer ends July 1. Free $5 Walmart Gift Card with ALL YOU Magazine subscription – Today you can score a FREE $5 Walmart Gift Card with ALL YOU magazine subscription! Free Music Downloads – People magazine is offering 8 FREE country music downloads through July 15. Artists include Chuck Wicks, Love and Theft, Justin Moore, Danielle Bradbery, and more. Free $10 from TD Bank Summer Reading Program – TD Bank is offering kids in grades Kindergarten through 5th grade $10 to add to a new or existing TD Bank Young Savers Account when they read 10 books this summer. Highly Rated Biosilk Hair Treatment Only $14.52!